When it comes to callbacks, many pest professionals find wood-destroying insects (WDI) problematic — beetles in particular. It’s not because excellent management options don’t exist. Rather, it’s because of the cryptic nature of these beetles and the tricky task of determining whether they are active. Customer concerns about potential structural damages can make investigating a WDI callback particularly challenging. Look for signs of fresh wood around the perimeter of the exit holes. Sometimes the outer wood has a “weathered” or darker appearance, whereas the inner surface of the exit hole has a “fresher,” lighter color. Count the holes in multiple areas of the wood, and return later to recount the holes. If more holes appear, there’s no doubt they are new. This method requires patience from the customer, though, with an observation period lasting a few months to a year to be certain. Listen for the “sounds” of infestation. Old house borers (Hylotrupes) can be noisy eaters; the later-instar larvae make an audible clicking noise as their mandibles rasp against the inside of the galleries. A quiet environment and a stethoscope can make this task easier. 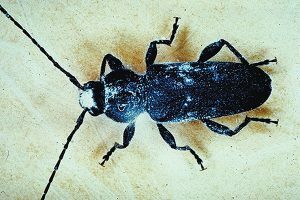 If beetles are still active, a retreatment might be in order. But if you can determine that the evidence is simply the remnants of the previous (controlled) infestation, you can avoid costly callbacks. Dr. Fredericks, VP of technical and regulatory affairs for the National Pest Management Association (NPMA), can be reached at jfredericks@pestworld.org.